What do changes in Earth's orbit affect most greatly? During a solar eclipse, the shadow of falls on . Which causes day and night? What causes the Sun to rise and set every day? Corn grew in the rich . 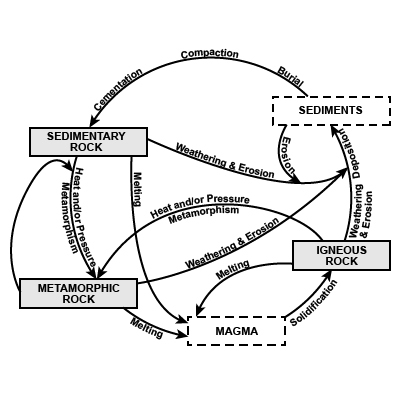 The diagram represents how any rock on Earth can be changed into a new type of rock. Rocks can change into new rocks through the processes of weathering, erosion, and cementation. These processes are driven by energy from . What is the order during a lunar eclipse? What is the main cause of Earth's seasons? During a solar eclipse, what are the positions of the Sun, Earth, and Moon? What is the order of the Sun, Moon, and Earth during a lunar eclipse? Rock melting, shown on the diagram, occurs and is driven by . What is the correct alignment during a solar eclipse? Which inner planets have atmospheres substantial enough to generate weather? What is the name of the small, watery, blue planet that orbits the Sun? Earth going around the Sun. the Sun going around Earth. What causes seasons on Earth?